Why I read this book: The first book was good, and I wanted to see what would happen next. I can't decide if I like this book more or less then the first, Incarnate (review). I think I like them the same amount, but for different reasons. Incarnate had a sense of the new and interesting. What is this world? Why is Ana around? That sort of thing. A sense of discovery. Asunder is really a continuation of that except now it's moved away from discovery and more into trying to find her place. Ana and the world are recovering from the events of Templedark during the beginning of this novel. Sam and Ana set off to find some answers, but really come back with more questions. We meet some new characters and discover more about some we've already known. The story itself progresses and Ana learns more about Janan and the sylph as well as new souls. The ending was pretty jarring in all that we learn and all that it means for the habitats of the city. Anyway, my biggest praise for this book is the realistic portrayal of Sam and Ana's relationship. I couldn't help but make comparisons to Twilight in my mind, because they both have a really old soul in a teenage body dating a teenager. Where Twilight just kind of glossed over the fact that Edward was really old, Meadows tackles the issue head on. It's actually quite a problem for the growth of their relationship, as I think it would be. I have to give praise for that. The other aspects of their relationship ring just as real. The story itself is pretty engaging. The world and it's rules are so different and yet the same. I am curious to see where this series leads! I haven't read Asunder and Incarnate but the story sounds really good and the world the author created seems to be very intricate and interesting. Great review! 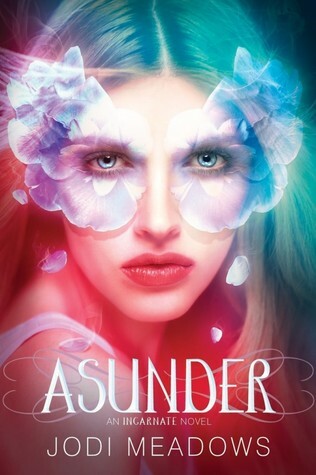 I loved Incarnate and I'm looking forward to reading Asunder. I'm happy to hear that you enjoyed it, but I was hoping for more answers than it seems I will get. Great review Julia! I have had Incarnate on my TBR list, and now you have made me even more curious about the series. I love that the age difference in the relationship is addressed and I look forward to reading that. Twilight is the most popular example of that "glossing over" and, while I forgave it for a long time, I have been longing for it to be addressed! I really thought this was a good second book in a series. A lot of times they will drag and just be filler. But this really satisfied me! !